Above, members of the Twilight Figure Skating Club during practice at Guy/Donnelly Sportex, January 22. Now into the last two months of the skating season, Twilight Figure Skating Club has reestablished itself at the Donnelly Arena. 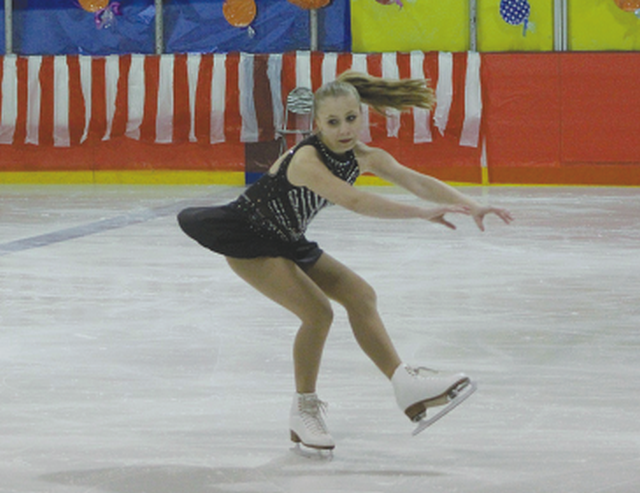 In competition, the club had skaters compete in Manning recently and at the Peace Region Star Skate Invitational in Grande Prairie on January 26 and 27. There are approximately six kids competing in the Grande Prairie event, ranging from STAR 1 To STAR 3 categories. The Twilight Figure Skating Club is now into its sixth year and has on average 30 skaters each season. Initially, the club coached kids up to Star 3, but now that one of the club’s coaches has advance her qualifications the club can now coach up to Star 5. Twiligh’s coaches are Josee Bouchard, Ashley Brochu, and Jackie Bouchard, and the visiting coaches who come twice a month are David Howe from Grande Prairie and Anne-Marie Behnke from Peace River. “David Howe has coached all across Canada and has coached kids in the Olympics, so he brings a very high level coaching for our kids and it is really nice to get that,” she says. An annual highlight locally and the club’s season finale is the Twilight Figure Skating Carnival, on March 10, beginning at 2pm. The carnival is the club’s main fundraiser but it is free to attend as it is by donation only. The event will also feature raffle tables and hot food and candy will be available. The annual carnival is always themed based, this year’s theme is “Animators Dream,” based on Disney, and Pixar animated characters, so the event promises some very colourful and animated performances. photo from an earlier skating event.